Optimal periodontal health with full, healthy gums is the foundation for strong teeth which can significantly contribute to good overall well-being and quality of life. At our Chicago periodontics & dental implants practice, our compassionate periodontist, Peter O. Cabrera, DDS, helps patients achieve optimal oral health with expert periodontal care and maintenance using innovative treatment techniques and technologies. We also believe that preserving and obtaining ideal gum health is a conjoined effort. When it comes to treating the essential structures of your smile, we not only walk patients through every aspect of their treatment, but we emphasize the important role strong communication and patient education plays in their periodontal care. Our periodontist takes the time to establish trust when providing expert guidance and essential instructions regarding what patients should be doing at-home to better prevent conditions that could jeopardize oral and gum tissue health. Schedule your periodontal consultation with Dr. Peter Cabrera and his team to explore your options towards a healthier, functional, and better smile today! Periodontics is the specialized field of dentistry that focuses on diagnosing, preventing, and treating the diseases and inflammation that can damage your gums as well as the surrounding structures that are responsible for holding your teeth in proper place. The primary goals of periodontics are to achieve and maintain ideal periodontal health while, at the same time, ensuring long-lasting function, health, and beauty remains throughout the smile. What Services are Considered Periodontics? Periodontal treatment methods depend upon the type and severity of your current gum disease or other conditions. Our specialist will evaluate your smile for periodontal disease and recommend the appropriate treatment. How Dr. Cabrera treats your gums largely depends on the stage of any infections and the amount of recession involving your gums, teeth, supporting tissues, and bone. After reviewing your digital x-rays and performing a thorough periodontal exam, he will discuss your treatment options, answer questions, and explain what happens next. How is a Periodontist Different from a General Dentist? A periodontist is a dental professional who specializes in the prevention, diagnosis, and treatment of periodontal disease, and in the placement of dental implants. Periodontists receive extensive training in these areas, including three additional years of education beyond dental school. As specialists in periodontal disease, they are experts in the latest techniques for diagnosing and treating periodontal disease. They are also trained in cosmetic periodontal procedures. Periodontists can treat many cases ranging from mild gingivitis to more severe periodontitis and gum tissue recession. Periodontists offer a wide range of treatments like removing infected tissues, eliminating oral bacteria, reversing lost jawbone dentistry and tissue, and many other procedures. Periodontists can also perform surgical procedures for patients with severe gum disease. Additionally, periodontists are trained in the placement, maintenance, and repair of dental implants. Gum recession is the process in which the gumline tissue that surrounds the teeth pulls away or recedes, exposing more of the teeth, or the tooth roots. When gum recession occurs, "pockets," or gaps, form between teeth and gums, making it easier for disease-causing plaque and bacteria to build up. If left untreated, the teeth, supporting tissues, underlying jawbone, and other structures are at high risk of being severely damaged with the possibility of tooth loss. Gum recession is a common dental problem. Most people don't know they have gum recession because it occurs gradually. The first sign of gum recession is usually tooth sensitivity, or you may notice a tooth looks longer than usual. Typically, a notch can be felt near the gum line. Why Did My Gums Recede in the First Place? Although receding gums is a common result of gum (periodontal) disease, there are numerous possible reasons for your gum recession. Gum (periodontal) disease - Gum disease is an oral infection that attacks the periodontal structures, like gums, teeth, tooth roots, and jawbone that are responsible for holding our teeth in proper place. Periodontal disease is the most common cause of gum recession. The early stage of periodontal disease is not often painful; therefore, symptoms often go unnoticed. If left untreated though, it can develop into periodontitis, the most severe and damaging stage of gum disease. Improper oral hygiene - Neglecting brushing, flossing, and rinsing with antibacterial mouthwash daily can make it easy for plaque to grow in abundance and to turn into tartar, a hard substance that forms on and between your teeth that can only be removed by a professional tooth cleaning. The toxins in plaque and tartar begin to irritate the gums, and they will start to pull away from teeth as a result. Orthodontic treatment - While there is no overwhelming evidence that orthodontic treatment directly leads to gum disease, some believe that the process of moving teeth leads to gum recession due to the constant pressure needed to shift teeth in a direction where the bone or gum tissue is thin. Brushing or flossing too hard - Through it always encouraged to brush and floss daily, brushing your teeth too aggressively or incorrectly can cause your tooth’s enamel to wear away and your gums to recede. Flossing aggressively can also cause gum tissue to become irritated and damaged. Genetics - Due to hereditary factors, some people are more susceptible to periodontal disease and/or gum recession because of limited gum tissue. Just has some individuals have an overabundance of gum tissue, resulting in a “gummy” looking smile, others can have the opposite problem with a lack of natural gum tissue. Hormone levels - Changes in estrogen levels over a woman's life, like puberty, pregnancy, and menopause, can make gums increasingly sensitive and vulnerable to gum recession. Tobacco products - Smokers, and other tobacco users are more likely to develop gum disease due to the sticky plaque which can also cause gum recession. Grinding and/or teeth clenching - Clenching or grinding your teeth can exert too much force onto teeth, causing gums to recede due to irritation. Crooked teeth or a misaligned bite - An uneven smile due to crooked teeth can pose multiple issues. Uneven spacing between teeth that are either too wide or too tight can make at-home care with flossing, rinsing, and brushing exceedingly difficult. This often results in leftover food particles and plaque to cause decay, infection, and irritate the gums, causing them to recede. Gum recession is not something you want to ignore. If you think your gums are receding, make an appointment with our periodontist. Numerous treatments can help repair the gums and prevent further damage. Deep cleanings: Your periodontist uses special tools to remove the plaque and tartar buildup on the roots of teeth where the gums are receding. This procedure is also known as root planing. Gum grafting: This involves taking healthy gum tissue from your palate, or roof of the mouth, or using a gum grafting material to replace the receded gum tissue. Your dentist may recommend you see a periodontist, a dental specialist who treats the gum tissue and supporting bone, for this surgical procedure. Regeneration: In severe cases of gum recession, the underlying bone may already be destroyed. However, with specialized and innovative treatment from a periodontist, this allows your specialist to administer surgical procedures where a regenerative material is placed in the area of bone loss to help regenerate bone and tissue. The gum tissue is then secured in that area where one or more teeth may have been involved. Gum recession most often occurs very slowly, sometimes over several years. In most cases, individuals don’t realize they have it because it can be tough to spot if you aren’t experiencing any pain or sensitivity. However, if you notice that your teeth appear longer, or the spaces in between appear larger at the base, contact our periodontist, as these are typically the early warnings signs indicating you may need gum recession treatment. Gum, or periodontal disease, is an oral infection that develops typically when oral hygiene is neglected. It starts with oral bacteria that feed on particles of carbohydrate-rich foods left behind after a meal. The bacteria metabolize carbohydrates and produce plaque acids, which deposit on the surface of teeth. The bacteria and plaque can be removed with brushing, but if the teeth aren't brushed, the plaque hardens into tartar. The tartar, along with the presence of bacteria, irritates the gums and causes inflammation and early gum recession. This stage is known as gingivitis, the earliest form of gum disease. Without proper treatment, gingivitis can advance into or periodontitis. As the disease advances it damages gum tissue, severely impacting jawbone volume, teeth, and the overall health of the smile. The gums become more swollen, looking puffy and deep red or purple. They bleed more easily and may start to recede from the teeth. 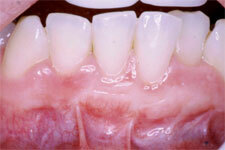 The eventual result of untreated periodontitis is tooth loss. There are multiple reasons why you may need to expertise of a periodontist. However, when the situation involves possible gum disease, it is imperative you schedule an appointment with these specialists right away. If you any of the following signs and/or symptoms listed below, be sure to seek proper periodontal care promptly. This is essential for the health of your gums, jawbone, teeth, and overall smile. Before initiating any form of gum disease treatment, our periodontist will extensively examine your gums, jawbone and the general condition of your teeth. When gingivitis or periodontal disease is officially diagnosed, Dr. Cabrera has a number of surgical and non-surgical options available to treat the underlying infection. Each treatment is designed to halt the recession of gums and other soft tissue and restructure or replace teeth that may be missing. Again, treatments for periodontal disease will depend on the stage and severity of your gum disease. Scaling & Root Planing: This procedure involves careful deep cleanings of the root surfaces to remove plaque and tartar from deep periodontal pockets. And smoothing the tooth root to remove bacterial toxins. Scaling and root planing is sometimes followed by antibiotics, as needed on a case-by-case basis. Most periodontists would agree that after scaling and root planing, many patients do not require any further active treatment. However, many patients will require ongoing maintenance therapy to sustain health. Laser Treatment: Laser use for treating moderate to severe forms of gum disease, is an innovative, non-surgical approach to eliminating infection and restoring gum tissue health. With lasers, we can access and remove the harmful bacteria beneath the gums. These instruments also disinfect the affected areas, greatly reducing bleeding, swelling, and discomfort during care. Pocket Reduction: This procedure promotes proper healing in gum tissues, encouraging them to reattach after scaling and root planing. During treatment, the gum tissue is folded back to remove the disease-causing tartar before securing tissues back into place. As a preventive measure, treatment with antibiotics is often administered either before or after your periodontal procedures. Ensure Your Overall Gum Health with Our Help! The goal of periodontal care is to encourage a healthy mouth, and Peter O. Cabrera is an expert periodontist, who is dedicated to tracking your progress as you make your way to a healthier smile. He happily continues to see patients after initial treatment for follow up appointments and maintenance. Schedule an appointment for an examination today to determine your treatment by calling or visiting our dental practice in Chicago today!